President and Founder of Independence Prosthetics-Orthotics, Inc.
At the age of 16, John was diagnosed with bone cancer in his R leg and was treated at A.I. DuPont Children’s Hospital where he underwent an amputation of his R limb and over a year of chemotherapy before having been recognized as a Cancer Survivor. 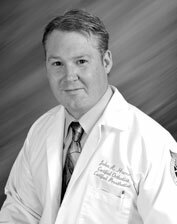 Despite the loss of his limb, John went on to graduate with his class at St. Mark’s High School and ultimately attended Northwestern University’s Prosthetic and Orthotic Certification program in Chicago, IL. John was introduced to disabled sports in 1991 through a ski program held annually at Jack Frost Mountain which was geared toward disabled skiers. In 1996, John participated as a torch bearer for the Paralympic Games in Atlanta, GA.
After 10 years of professional experience, John founded Independence Prosthetics-Orthotics (IPO) and currently has office locations throughout Delaware and the Greater Philadelphia region. As president of IPO, John has created a company dedicated to patient care and focused on education, innovative technology, as well as reintegrating individuals with physical limitations back into productive and active lifestyles. In 2011, John advocated for the passing of Prosthetic Parity which would ensure Delawareans with limb loss would receive adequate medical coverage through private insurance company benefit plans and by 2012, the law was signed into effect. John is the first regional business owner distinguished as a Disabled Owned Business Enterprise by the US Business Leadership Network. John also serves as the Delaware State Representative for the American Orthotic and Prosthetic Association and is an active member of the Amputee Coalition (a national organization for those with limb loss).